Last week I made the trip up to the Mount Baker Ski area and Artist Point at the Mount Baker-Snoqualmie National Forest in Washington State, USA. First I made the obligatory stop at the iconic Picture Lake (more on that soon) to eat my soup, then I photographed some of the fall colours in the Mountain Ash and Blueberry bushes in the Heather Meadows area. 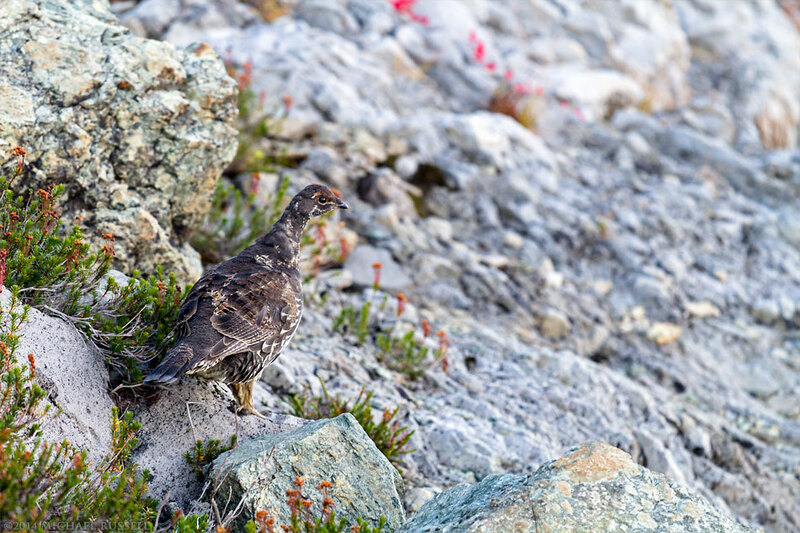 After arriving at Artist Point I photographed this Sooty Grouse (Dendragapus fuliginosus) on the trail to Table Mountain. As with most of my wildlife photography, this was an opportunity I happened upon rather than directly seeking it out. Wildlife was not on my mind but there were 3 of these Grouse foraging near the trail. Well camouflaged, I didn’t even see them until one of them flew out of my way from the edge of the trail. I switched lenses and got ahead of their direction of travel, and they walked right past me. There are a lot of visitors here, so they are likely used to people, but it is still always better to let wildlife approach your position than the other way around. You can view more of my wildlife photography in my image archive’s Animals & Wildlife Gallery. i had similar experiences with grouse on a trail above Paradise on Mt.Ranier and also on a falls trail in Waterton Lakes NP…They seem to be unafraid of humans as long as you don;t try to get too close …Wonderful birds ! I mostly ran into Marmots on the trails above Paradise. The terrain is a lot like that of Artist Point though – if only the Mt. Baker area had the same amount of wildflowers!